Categories: 2 channels, 3,0 kV, 600 VAC/DC, Passive, Slim (6 mm), Isolators, No, Isolators. 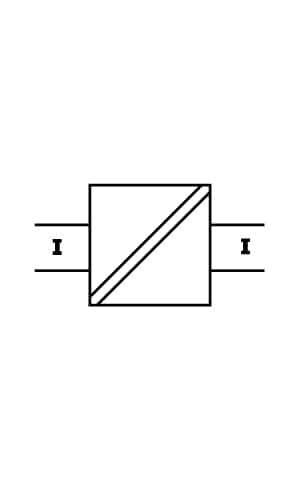 The input loop-powered isolator IsoPAQ-612 provides galvanic separation for 0(4) … 20 mA standard signals, while transferring the measurement signal to the output with a high degree of accuracy. The unit avoids interference voltage carry-over and effectively suppressing parasitic noise. The very low drop voltage of 2.3 V and the high level of accuracy work together to make the IsoPAQ-612 the first choice in system design. Intelligent design and their consequential avoidance of highly integrated components result in extremely long service lives and reliability – without any falsification of the measurement signal. 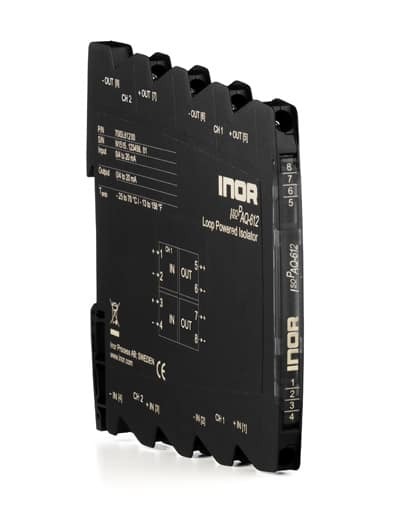 The IsoPAQ-612 requires no additional power supply since the auxiliary power is obtained from the input signal without distorting it. This not only saves costs during installation, but also increases reliability..
Protection against electrical shock Protective separation according to EN 61140 by reinforced insulation in accordance with EN 61010-1 up to 300 V AC/DC for overvoltage category II and pollution degree 2 between all circuits.